The 1940s is a fascinating decade for vintage fashion. 1940s glamour is a distinctive thing - broad padded shoulders, elaborate hairdos and hats, and fashions that are simultaneously feminine and militaristic, the influence of WWII is deeply felt in every aspect of the fashions of the decade. Skirts became shorter and narrower due to fabric shortages; women, unable to express themselves through fashion, turned to beautiful hairstyles, hats, and turbans to express their style and femininity; and the broad shoulders, slacks, and military detailing on clothes reflected the ever present specter of war all around them. 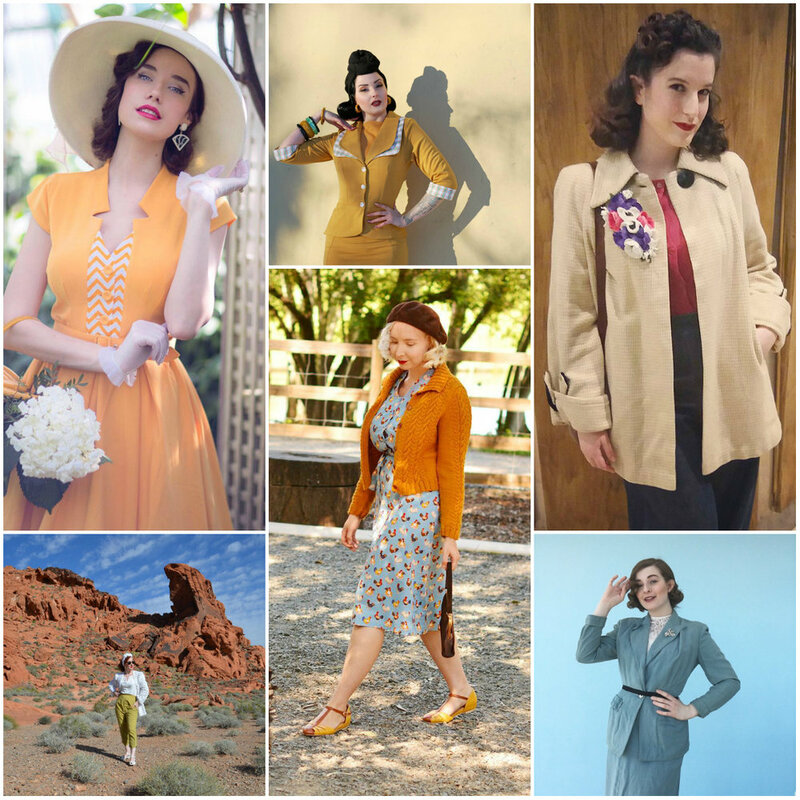 Continuing my long dormant series (check out my favorite 20s and 30s style Instagrammers here), read on to see some of my favorite Instagram account for 1940s fashions. This glamorous gal always looks like a perfect fashion plate. She's got a real way with turbans, and I love her fabulous brand of 1940s high glam. Irene has a great sense of style - both polished and relatable. I especially appreciate all of her beautiful swing coats! Full disclosure - I know this gorgeous girl, and she's just as lovely in person as she is on Instagram! She's a daily vintage wearer, and her outfits are always perfectly put together and beautifully wearable. I believe I may have included Harlow in my 20s/30s post, but she's just that versatile! Her collection of pretty print dresses is irresistable, and she always finds the most perfect accessories to boot. Alba (Miss Banana, if you're nasty) has one of my favorite IG accounts, full stop. Chock full of gorgeous photos of herself, as well as beautiful inspirational illustrations, her account will definitely have you rummaging through your closet and trying to recreate her magic! How lovely is Wilhelmina? There's a good reason she's the current Miss Viva Las Vegas! As glamorous and as stylish as they come, this vintage vixen will have you practicing your 1940s turban tying skills, at the very least. The hat game is strong with this one! Regularly decked out in stunning vintage suits and WWII uniforms, this lovely lass is elegance personified. What are your favorite accounts for 1940s fashion? Are you going to check out any of these stylish vintage ladies?